Francophone settlement rapidly increased in the Mattawa area with the arrival of the Canadian Pacific Railway (CPR) in 1881. During construction of the rail line, the local economy benefitted from the presence of thousands of French-Canadian workers, some of whom were accompanied by their families. 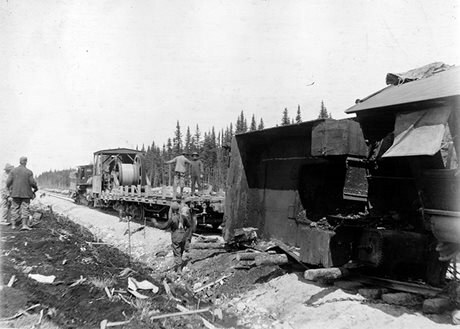 Once the railway was operational, the local lumber industry expanded and Mattawa prospered as a community, a supply and transportation hub, and a lumber depot. Development was also stimulated in the towns to the west of Mattawa along the CPR line – Eau Claire, Bonfield, Astorville and Corbeil – communities that also benefitted from significant numbers of French-Canadian settlers during the 1880s. These people brought with them their unique culture and heritage, and left a lasting francophone legacy in this area of Ontario. Visit the plaque – At the Mattawa and District Museum, Explorer’s Point, 285 First Street, Mattawa. YouTube video – La migration des Canadiens français en Ontario après la Confédération, 1868 (in French).